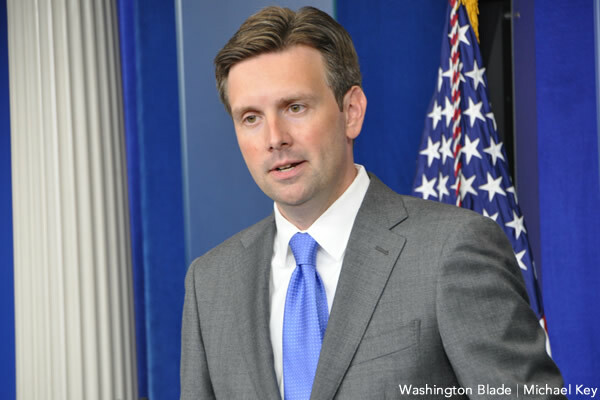 White House Press Secretary Josh Earnest said Thursday the Obama administration has no position on ending the U.S. military’s ban on transgender service — an apparent reversal of a previously stated position in support of discontinuing the policy. UPDATE: White House Principal Deputy Press Secretary Eric Schultz said in a follow-up email to the Blade the Obama administration’s position on transgender service hasn’t changed. In addition to calling for an end to the ban on transgender military service, the New York Times editorial board quotes two U.S. service members — Staff Sgt. Loeri Harrison and Senior Airman Logan Ireland — who could face a discharge because of their gender identity. Sue Fulton, president of the LGBT military group SPARTA, said she remains confident the White House’s previously stated position still holds of supporting a change in the military’s trans ban. The issue of transgender military service is gaining prominence. On Wednesday, former Rhode Island Gov. Lincoln Chafee on the first day of his presidential campaign joined Democratic candidate and U.S. Sen. Bernard Sanders in calling for an end to the ban. Former Secretary of State Hillary Clinton has yet to comment explicitly on the issue. At at upcoming Pentagon Pride event on Monday, Sheri Swokowski, a transgender infantry veteran, said she plans to wear a female Army uniform with an infantry insignia to take a silent protest against the U.S. military’s continued ban on transgender service. What kind of President is so Wishy Washey on a Simple item respected by many educated countries for some years now. They should put as a requirement for President that THEY HAVE TO SERVE THEIR COUNTRY!?! ?